6 Thrift And Consignment Stores Online And IRL, Because Who The Heck Can Afford Designer Full Price? There is no shame in you or your closet having a case of wintertime fatigue — but there is a solution. When annoying blizzards have limited your mobility to the interior of your home, add a bit of sartorial sunshine into your life by swapping your worn wares for something fresh, unconventional, and pre-owned. As any fashion consumer knows all too well, designer creations can be laughably exorbitant, and what 20-something has room in their budget for a $2,000 frock or bag? Enter online consignment stores, which offer designer wares and elegant basics for a fraction of their original price. Clothing and accessories depreciate in value even after their first wear, or so the theory goes, so why not exchange one of your ancient items for someone else's? 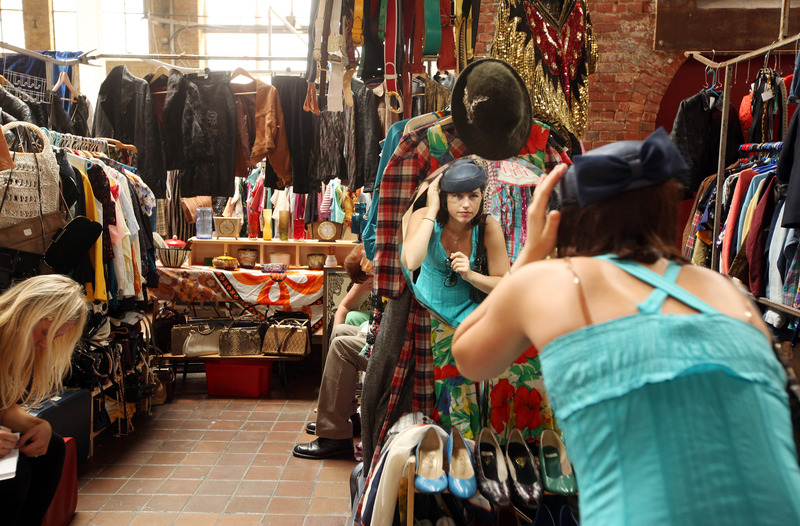 Consignment vendors aren't solely for those who appreciate sporting vintage clothing. If your closet is packed a bit too tightly and your wallet is less than full, consignment companies can be incredibly helpful in procuring extra pocket money. When you decide to relinquish your clothes or search for pre-loved items, the internet — and the streets — can be overwhelming with choice, and those in search of a bargain will find some businesses more accommodating than others. Read on for the six best places to buy and sell consignment clothes for your best wardrobe yet. For ardent vintage shoppers, passing through New York City without popping into New York Vintage is a mortal sin. The beloved Chelsea-based shop is truly a transcendent experience for anyone with a mind for styles of decades past. Breathtaking designer wares from decades past jostle for space with a pristine collection of stilettos, booties, and flats, conveniently placed next to the store's glass display cases of other essential accessories. Favored by celebrity stylists like Rachel Zoe, who utilize the store's seemingly infinite selection of red carpet-worthy gowns to dress their clients, the store is everything you could hope for in a vintage vendor. In addition, the store offers appointments to those looking to sell their pieces — if those pieces happen to be in excellent condition and of a certain designer caliber, of course. However, laypeople looking for celebrity treatment should be forewarned that the store's private collection isn't available for viewing or purchase to the average browsing shopper, and the store's price point is fitting for the type of unique, designer pieces they sell. Though the 2011-founded Threadflip may be new to the online consignment sector, the company is rapidly growing into a favored social site to buy and sell pre-loved items. Complete with an ultra-handy mobile app, Threadflip allows user to snap pictures of their items, upload their images, and secure a substantial return from their sales. Users are supplied with a convenient free shipping kit to make the process of selling items even simpler. Once a sale has been made, Threadflip uses PayPal for all financial transactions to make sure the parties involved are protected from fraud. Aside from its mobile capabilities and easily navigable site design, Threadflip excels most in the buyer experience arena. Scrolling through the selection of impossibly low-priced wares is a treat for the eye and the wallet. Case in point, a pair of Manolo Blahnik suede pumps is a mere $220, which equates to one-third of the shoe's $600 retail price. Forget wading through the bargain bin at your favorite boutique and scroll through the pages of covetable looks on Threadflip this winter from the comfort of your own home. If you've ever watched Guiliana Rancic's awards show coverage via E! Live From The Red Carpet, chances are you've witnessed a gown from Decades. With a stylist-favored Flagship store on Melrose Avenue in Los Angeles, Decades is a fixture in the fashion world for its unparalleled selection of pristine designer wares. The store does accept consignment pieces, but sellers should be aware that a pilled cashmere sweater from J. Crew won't suffice for Decades' high standards. In addition, the store's owners Cameron Silver and Christos Garkinos are happy to schedule consignment viewing or home visits to evaluate your wares — but only if you're offering something truly covetable. Home visits are only available to those with 100 items to part with, so you may wish to save that option for your 90th birthday. If you happen to possess a Saint Laurent handbag you don't care for anymore or a Chanel brooch, you're much more likely to pass muster. However, the store is top-tier where vintage and consignment wares are involved, and Decades even offers an under-$300 sector for those who don't possess Jennifer Aniston's net annual income. Perhaps eBay isn't the most glamorous online retailer of consignment and vintage wares, but if you play your cards right the website can keep your wardrobe stocked with designer labels and free of extraneous junk for a minimal price. Unless you've avoided resale websites for the past two decades, you're likely familiar with eBay's straightforward format. Sellers can photograph their wares and customize their settings with a minimum sale price, "Buy It Now" option, and length of auction time to secure an optimal price for their items. Once a sale is made, eBay provides an option to print a shipping label directly off the website, and institutes a strict policy on payment which requires buyers to transfer the required funds to their seller in an allotted timeframe. As the eBay marketplace is so vast, the site provides a much-needed review option where buyers and sellers can rate their transactions and call attention to potential fraudulence. For eBay users, the true luxury occurs when that barely-used pair of Christian Louboutin's arrives in the mail for a quarter of their typical retail price. A venerated source for authenticated luxury consignment amongst fashion industry insiders, TheRealReal provides exactly what its name would suggest: a curated selection of designer consignment items, without any of the imposter brands you might find elsewhere. After being thoroughly examined by appraisers and authenticators, items are placed on the site at a deep discount from their original prices. In addition to the basic categorization of designer goods, the site also provides flash sales with titles like "Valentine's Day Gifts For: The Social Sophisticate" and "Desk To Drinks." If you're more interested in consigning than purchasing, the site offers white glove pick-up in 16 United States cities or free shipping before authenticating, photographing, and selling your items. The majority of designer items listed on the website will find new homes in three days, leaving sellers with between 60 and 70 percent of the sale price. For those who fully subscribe to 2015's culture of instantaneous everything, SNOBSWAP is the yardstick by which all online vintage and consignment retailers should measure their efforts. In addition to providing access to consignment boutiques across the United States, the site also allows users to buy, sell, and swap items from their own closets. SNOBSWAP provides two overarching options, dividing consumers into sellers or shoppers — and for devotees of the site, a bit of both. Sellers may select items from their closet to sell or swap and list them on the website, or utilize SNOBSWAP's handy Closet Concierge to enlist a member of the company's team who will do the heavy lifting for you. Those strictly looking to purchase consignment clothing will be treated to the same streamlined experience, as the site's categorized designer wares range from timeless Versace shifts to Dolce & Gabbana gowns with options to "Buy Now" or "Make An Offer." The site requires consumers to create an account before making their first sale or purchase, but the effort is worth it when you receive your very own Louis Vuitton frock in the mail for a fraction of its original price.